Big Ol' Hunks of Catfish in Cabot at Uncle Dean's. 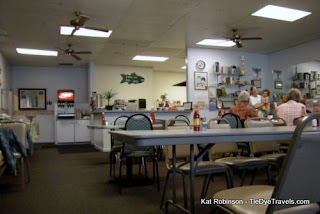 Looking for a good place to get catfish on Friday in Arkansas? It's hard to beat Uncle Dean's in Cabot. Local favorites are an interesting phenomenom. If you were to, say, go to the Amazon and were offered a local favorite, you wouldn't be surprised to find it was baked pirahna. Or if you were up in Maine, clams wouldn't surprise you. So in Arkansas, when you're asked about local favorites and are offered catfish, you tend not to bat an eye. 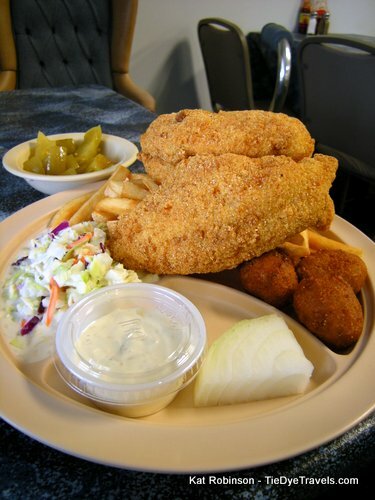 Mississippi may have the cinch on being the capital of the U.S. catfish industry, but it's a pretty big deal here in Arkansas, too -- as evidenced not only by the plethora of catfish farming operations but also by the abundance of fish fry houses. In fact, when folks from out of state (and country) talk about how much fish the British must eat because of the popularity of the "fish and chips" shop, I just kinda smirk. If you think about it, that's exactly what we have. 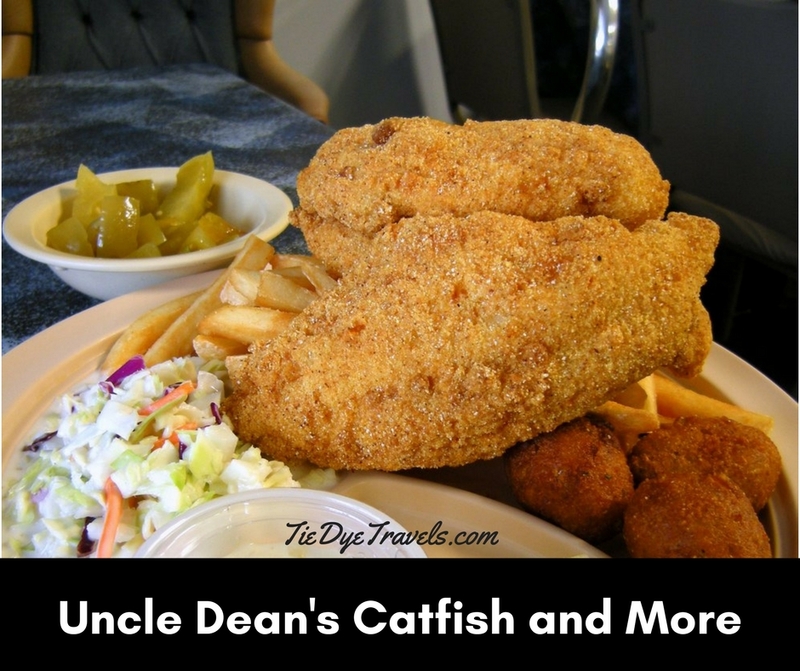 And while there are many places around that do catfish and fries and hush puppies and a while lot more, Uncle Dean's in Cabot pretty much sticks to the staples. That is, if you don't count the egg rolls. That's right -- I said egg rolls. The mom and pop operation on Second Street in Cabot sits in-between the city's parks and recreation department and a place that sells nails and live bait. Can't get much homier than that. But it's been recognized by the Catfish Farmers of Arkansas for serving only American farm-raised catfish. Has to be pretty good, since the Arkansas Democrat-Gazette has apparently reviewed them three times (as evidenced by the framed newspaper articles by the register). You go in, you order at the counter, you sit down. An incongruous mix of country diner, Oriental restaurant decor, paintings of Christ and upholstered captain's chairs suit the carpeted dining room, while a room-length mirror is featured on the eastern wall. We placed our orders and sat, and within moments out came our fried pickles ($2.99 for four). 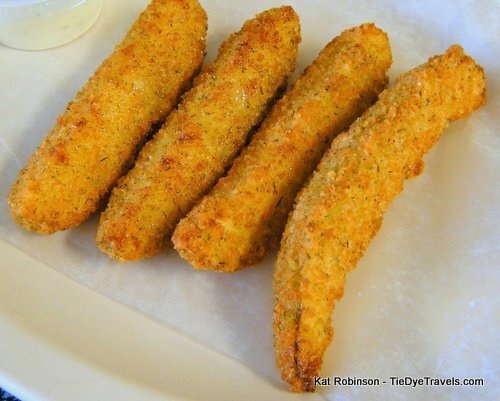 These are of the Vlassic variety, still crisp and coated with cornmeal batter and served up with Ranch dressing. While above average, our biggest complaint was that they were served way too hot. As if that should be a complaint, right? Our dinners soon followed. We had both ordered the Catfish Dinner (3 pieces for $6.99). The catfish is a tiny bit on the salty side, but the muddiness is light, and the cornmeal-heavy batter is neither overpacked nor underdipped. Best of all, the portions are large and thick full filets, which means you actually get more fish than crust. Dinners are almost identical -- fish, fries, slaw (which is similar to KFC's in its appearance and runny-ness but less sweet -- which is fine), hush puppies (made from buttermilk and spices, which gives them a savory kick that is neither sweet nor dry) and onion wedge. The only difference is how many of the filets you choose. 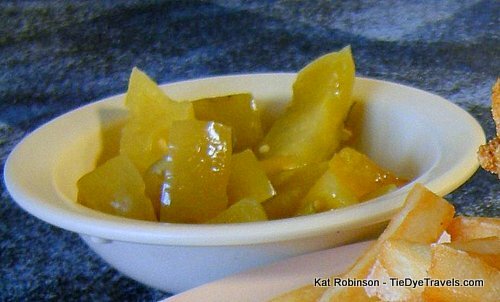 The pickled green tomatoes cost a dollar more -- but for me, that's an Arkansas staple that goes with catfish like rice with beans. Here they're both crisp and tangy, with a late heat to them that doesn't interrupt too much. The pie special disappointed, though. I guess I've been spoiled by my travels, where every destination seems to have some sort of magnificent homemade dessert. I went back to order it, and was shocked to discovered my $2.19 pie was a pre-packaged foodservice carton containing a wedge of sweetness. Well, I guess there's something for everyone out there. And while yeah, that was a surprise, it's not enough to sink the catfish at Uncle Dean's Catfish and Such. Gotta try the fried wings next time I go, since that (and the egg rolls and a cheeseburger and something incongruously called Heeya's Steak Sandwich) seems to be the entirety of the menu. I suppose it's a matter of "do one thing, do it well." And this is some mighty fine catfish. You'll find Uncle Dean's Catfish and Such at 818 South Second Street in Cabot. They do take call-in orders -- (501) 941-FISH. Check out the Facebook page. Have you tried N & N Restaurant in Cabot? You really need to taste their catfish and hot wings.... best in the state!